Finding good bridesmaid dress images is the best way to help pick and choose what types of bridesmaid dresses are going to look best on your attendants. Being able to see all the styles, colors, and ideas other brides have had help you to see what options are available, eliminate what you don’t like and work with what you do. These bridesmaid dress images are here to show some of the most common options available to brides today to help make picking the dresses for your attendants simple and easy. Traditionally, brides have dressed their bridesmaids in matching dresses as in the image above. It can look lovely, as the ladies above look, but be forewarned. Not all dresses will look excellent on all your attendants, so if you choose to go for one dress style for all of them, try to go for one that will flatter everyone rather than just a few of them. No one wants to be that odd-bridesmaid-out that people remember with pity twenty years later. These two bridesmaid dress images show options for the same dress, but the one directly above shows how even the same dress can be spiced up to show off different members of your bridal party. For example, your maid of honor can be in a main color with an accenting sash, as in the photo, while your remaining attendants can be in dresses that match the color of her sash with their own accents in the color of her dress. The style of their dresses matches, but this little twist in color can bring a freshness to your bridal party. If you just can’t find a style that suits all your needs, take a look at this bridesmaid dress image. 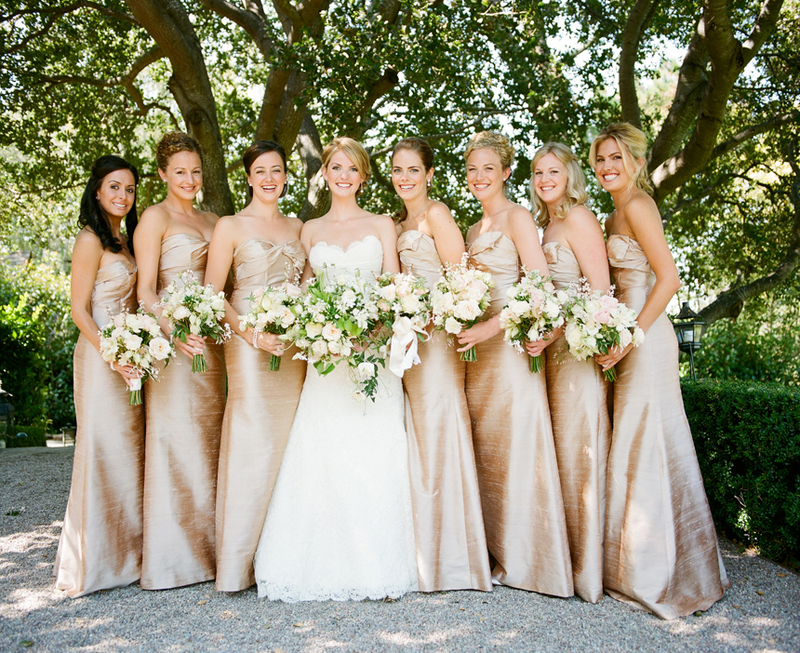 It shows off the idea of picking a color, but then letting your bridesmaids pick the style that best suits them. This is becoming an increasingly popular option, especially as it allows bridesmaids to pick a dress that not only flatters them best, but also a dress that is in their price range! The last of the bridesmaid dress images shows the idea of simply giving your bridesmaids a color scheme and giving them free reign to go out and find a dress with little more than a length requirement that suits them in price, color, and style. It looks just as classy and beautiful as the other three options, but allows your bridesmaids to feel their best, look their most beautiful and truly help you shine on your wedding day.